Getting around in Rock Revolution is rather simple (after a unnecessary into to the menu system, but not the gameplay). Multiplayer is on the first menu page, but finding the Single-Card Download play option or the Battle option (Multi-Card) is not obvious as it could be. Download time is average. The menus' touch screen inputs function perfectly. Everything is well labeled (when you can find it to get it onto the screen) and tappable options are sufficiently sized and/or spaced. Gameplay in the demo is simple: draw lines. Draw them upward or draw them downward through a circle at the right time. While some people may consider its sensitivity to be a bit "touchy" (demanding), this functions properly. The graphics are intentionally simplistic, which in itself isn't bad (art style opinions aside). The sound is, unfortunately, at a very poor bitrate and sounds muffled, or even muted. In terms of features, there are no selectable options, there is only one available song, and the only instrument option is the same basic guitar part for both players. NOTE: This review applies only to the game's Single-Card Download portion. 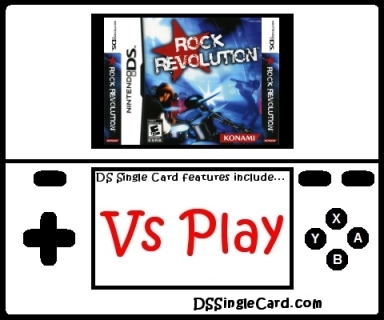 When Rock Revolution was released for the Nintendo DS and I discovered that it had Single-Card Download play, I had (skeptical) hopes that it would be a fun little versus experience. The Guitar Hero: On Tour franchise for the Nintendo DS can't have Single-Card Download play (it requires the fret attachment for the GameBoy Advance slot) and guitars are it's only instrument for the Nintendo DS so far (though I am hoping for a good Nintendo DSi Guitar Hero with multiple instruments some day). Rock Band has not shown up on the Nintendo DS (yet). So, when Rock Revolution showed up and had the feature, I was surprised - and cautiously optimistic. What I found when I played Rock Revolution's Single-Card Download multiplayer, however, was a total let down. The sound (remember, this is a music game) was poor. There was only one song available. There was only one instrument available (yes, both players played the same part). There were no options - like difficulty. When the song's over? The guest is forced to power off (there's not a replay feature). I remember a time when a genre was popular (platformers, shooters, simluations, etc.) and every developer and publisher would try to outdo everyone else's game to earn the money. Now, it seems that developers and publishers instead try to throw something together as quickly as possible to get at least a little money before the genre goes out of fashion (there are a very few exceptions). It's times like this I long for those old days. Y'know, before Rock Revolution for the Nintendo DS was released. Replace the introduction to the menu system with a gameplay tutorial. Make the Multiplayer menu system easier to navigate. Improve the poor sound quality. Offer multiple songs and multiple instrument options for the download. Allow players to replay the song without powering down. Click here to return to the DSSingleCard.com Rock Revolution profile.